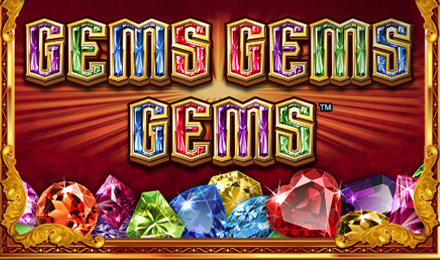 Bring on the Bling when you play Gems Gems Gems slots! There are 4 reel sets packed with glittery jewels for loads of sparkling wins! Spin to WIN this luxurious online slot! Gems Gems Gems slots is a sparkling online slot machine packed with glittering gems! There is a main 5 reel, 20 payline reel set and three additional reel sets on the right of the screen. With 4 sets spinning at once, there are an amazing 80 paylines with every spin! When you land Wilds and Scatters on the main reels, it is reflected on the other sets and gives you increased chances to win! Land the Diamond Scatter to win 10 Free spins! Free Spins wins are multiplied according to how many Scatters are found on the reels. You can get up to a 12x multiplier on Free Spins wins!